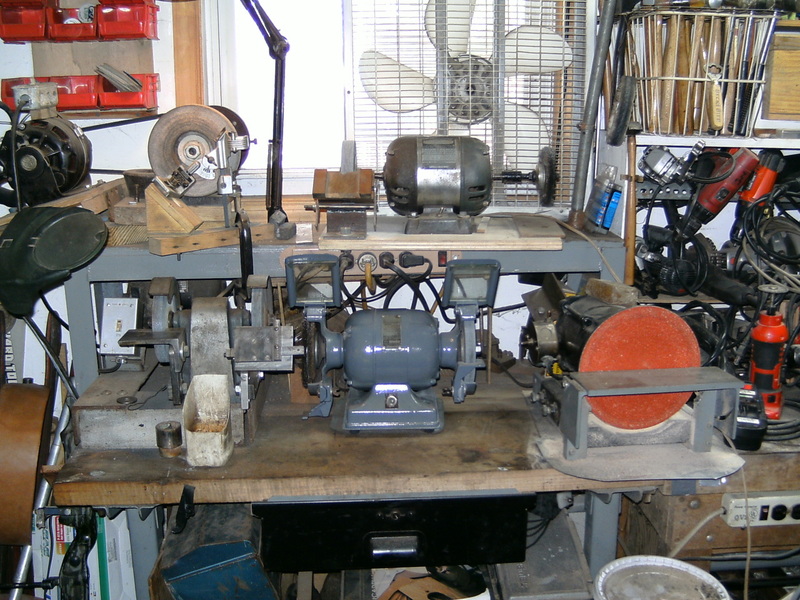 This is a jig I threw together from things in my shop that makes it easy to create hollow-ground knife bevels. I would have made an instructable out of it, but I don't have any pictures of the process and it's pretty easy to see how the thing goes together any way. The metal widget with the springs is there just to make sure the work rest (the piece of cherry with the c-clamp on top) doesn't move around and change the distance of the knife to the wheel. The c-clamp itself is cut down so I have a better view and control of the knife while grinding. I can also move it around to accommodate blades of different widths and thicknesses. The last few images are of a knife I recently made with this jig, what I'm calling a "camp seax." Straight edges are easier. If you've seen my knifemaking Instructable, you can tell that I've greatly improved in a couple years. can this be applied to a bench grinder? Definitely. It's a little beefier than the tool rests that come with most grinding wheels, too. just bein nosey here,is the base of yer jig a chunk of purpleheart? I'd like an instructable on how to build your grinder. Where'd you get that? hey basta, about how much did this cost completely? All I bought were the springs, the rest was scrap lying around...so I spent about $2.50. YMMV, especially if you don't weld. I'd guess about $20 for all materials. I like it! How do you adjust your belt tracking? There's a lever to the side of the platen that tilts it laterally--part of the grinder, though, not the jig. For hollow grinding chisel and plane blades mostly. I didn't know I could get the original resolution on this website of uploaded images. This is pretty good, and I think if you set this out as an instructable with notes to go with each of your pics, you would have a decent 'ible. None of your parts look difficult to make. Great work.